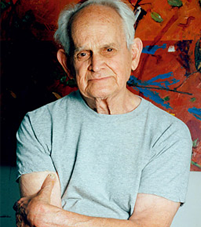 The life and work of American writer and painter Manny Farber, one of the most celebrated and idiosyncratic voices in the history of film criticism, will be honored by New York's Film Society of Lincoln Center in a two-week festival—simply titled Manny Farber, 1917–2008—beginning Friday, November 14. The program consists of films he championed in his writings for such publications as the Nation and Time, as well as those he presented in classes he taught at the University of California at San Diego, and includes Yasujiro Ozu’s I Was Born, But . . . , Robert Bresson’s Mouchette, and Nicolas Roeg’s Walkabout. Other Farber favorites on the slate come from Jean-Luc Godard, Alain Resnais, Preston Sturges, Don Siegel, Roberto Rossellini, and, of course, Howard Hawks. Farber died in August at the age of ninety-one. You can also read two interviews with Farber, from 1977 and 2000, on Film Comment's website.